This is a guest post written by Jan-Willem Ligtelijn of the Sir Miles B.V. agency. “Advanced ecommerce tracking” is one of the key features of Google Analytics that can really help you dive into your online business flows and revenues. Piwik PRO also lets you expand the basic online cart tracking functionalities, although it may achieve similar results in a slightly different way. Advanced ecommerce tracking provides you with information on product interactions throughout the entire shopping process: from item impressions and clicks, through viewing item details, to adding or removing the item from a shopping cart. It also automatically traces the checkout process, transactions, and even refunds. To use these features you’ve got to have some coding skills or know someone who does. Let’s be honest, it’s not as easy as flipping a switch. But here’s a primer on making it work for you. While Google’s advanced ecommerce tracking is more elaborate in its “off-the-shelf” features, Piwik PRO can also provide you with a wealth of very useful information about your shoppers. 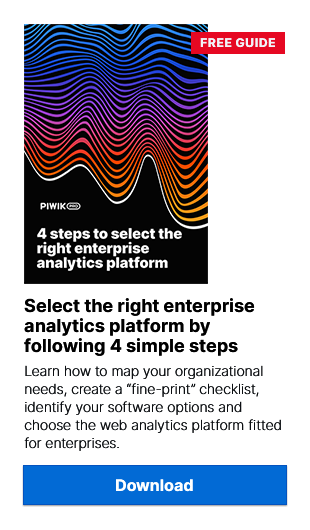 What jumps out at us right away is that while Google Analytics provides most features “out-of-the-box”, Piwik PRO can also deliver similar functionalities with smart implementation of various reports, such as funnels or content tracking. By using Piwik PRO Tag Manager things get even easier, because most custom events can be easily created without editing a single line of code. Use this function to learn what product or category is being viewed. Piwik PRO reports which product or product category was viewed by the visitor. Use this function to push all cart items every time a product is added or deleted from the cart. This function should always be followed by trackEcommerceCartUpdate. Use this function to learn about updates to the cart total. When the total order value is amended, i.e. when visitors add or remove something from the cart, Piwik reports this action. Use this function to learn when a successful ecommerce order is placed. This function is regularly triggered when the visitor lands on the order complete or the order success page. Piwik PRO provides a very practical way to track logged-in users across different sessions and devices. This is possible with a feature called User ID, which lets you assign each visitor a unique value such as username, e-mail address, or other specific identifier. One of the key benefits of User ID is the way Piwik PRO can track the user across devices. For example, let’s say that you are visiting a web shop anonymously. After a while you log in. Your current visit history will be migrated to your login identifier/user id. Even if you log in using another device (e.g. tablet), Piwik PRO handles this as one visit. This is particularly convenient when your order is handled through an external payment portal, or if you have a vendor setup with different payment providers. With a simple integration of Piwik PRO tracking code on the external page and pushing the same user ID, you can follow the order and the user through an external domain. Jan-Willem Ligtelijn is a technical marketing specialist at Sir Miles B.V., based in the Netherlands. Sir Miles is a consultancy firm that specializes in web statistics interpretation, Piwik integrations and MarCom consultancy.